Over at Scrap Africa you will find a bunch of examples of resist effects for scrapbookers and card makers. Hop over to the BLOG to be inspired by all the lovely examples. I have used clear embossing ink to stamp the large background image. I then covered the "wet" image with America Crafts Zing clear embossing powder. I then used a heat gun go heat set then embossing powder. I completed the background by colouring the background with Ranger distress ink and a blending tool. I then splatted a few small drops of water on the background to make the little white dots. 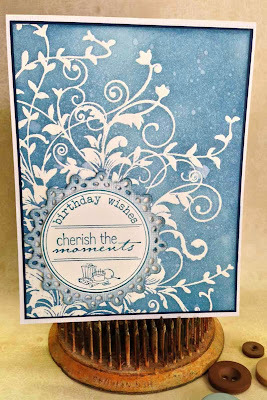 I used a stamp from the BIRTHDAY LETTER SEALS set from WHIMSY STAMPS to stamp the "birthday wishes" image. 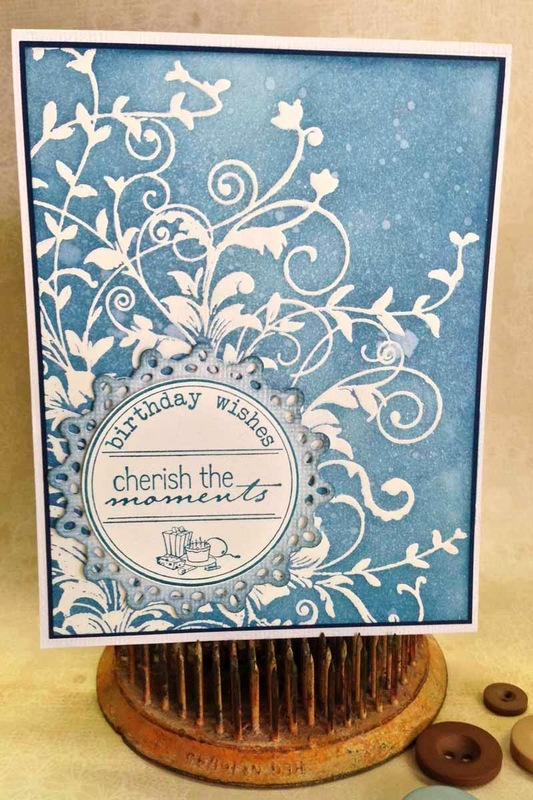 I stamped the image in a matching blue to keep to the monochromatic look and feel of this card. I punched out the stamped image and then layered it onto a pretty doily, cut from the Lifestyle Crafts/Quickutz die-set, NESTING DOILY CIRCLES. I used the same colour distress ink to colour this doily. The whole background was then layered onto a dark blue cardstock to round it off nicely. TO THE SCRAP AFRICA BLOG. I like this tecnique, beautiful card!